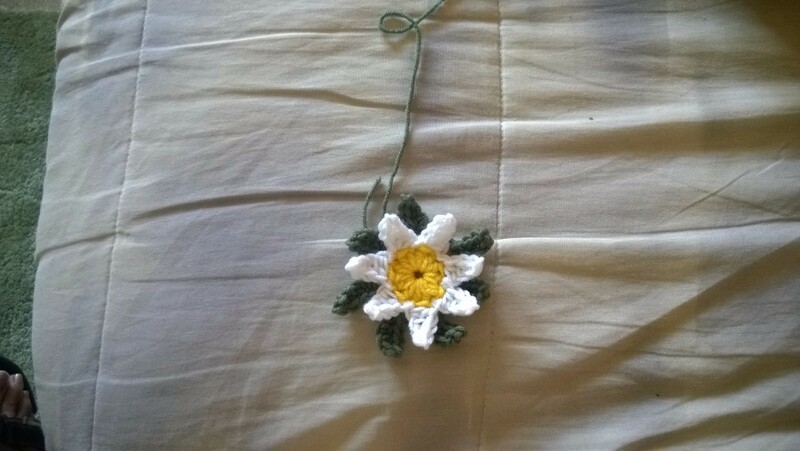 I made 12 daisies, but only used two for this project. I will see what to do with the other 10 later! 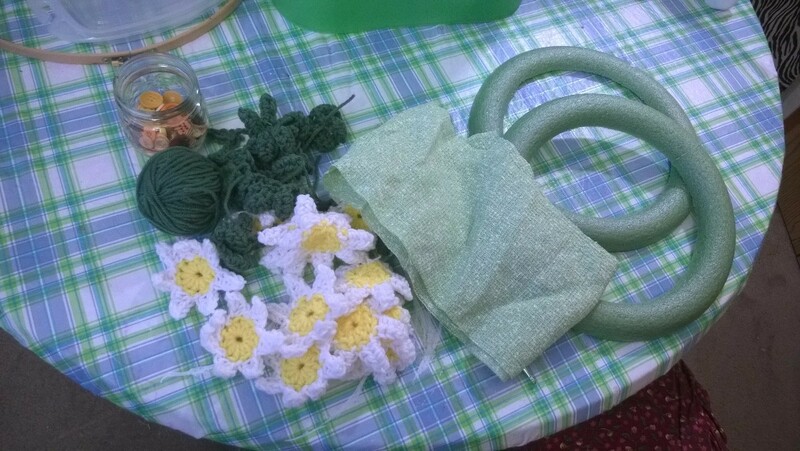 This is labor intensive, but for a seasoned crocheter, not too hard. 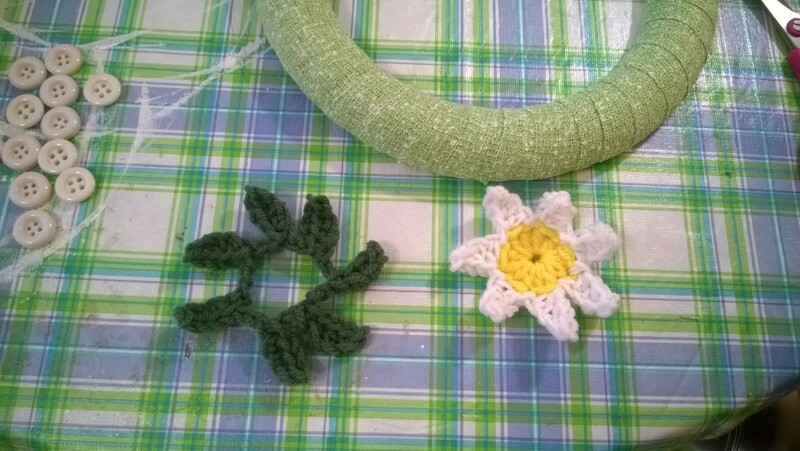 Daisy directions: With your hook, chain 2 and make 14 double crochets in 1st chain from hook. Join and break off. Weave in tail. Make 2 of those. Add your white yarn to any stitch. Chain 4 and make a single in the first chain from hook, then a half double in each of the last two stitches. Slip stitch your petal in the next stitch. Repeat around 6 more times for 7 petals. Chain 2 and join and break off. Weave in tail. I am sorry I forgot to take a shot of just the daisy, but you see it in the photos. 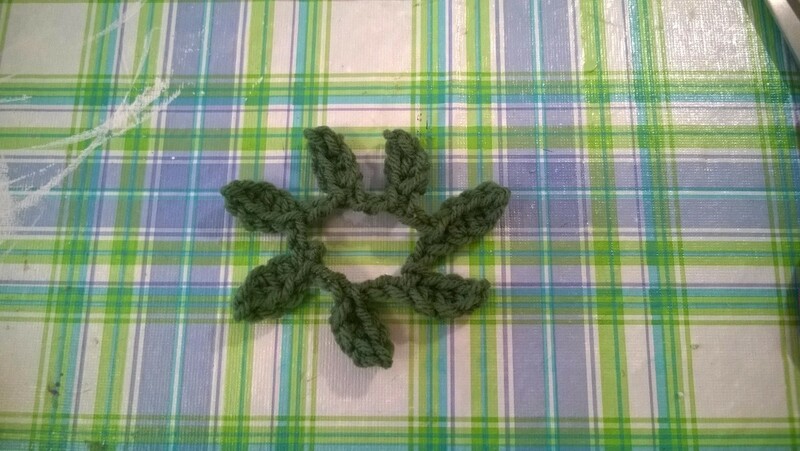 To make the leaves, with your green thread, chain 5 and make a single, two doubles and a single in the last 4 chains. Chain 7 and make the same leaf, leaving the last two chains for a 'spacer'. Repeat 6 times for 7 leaves. 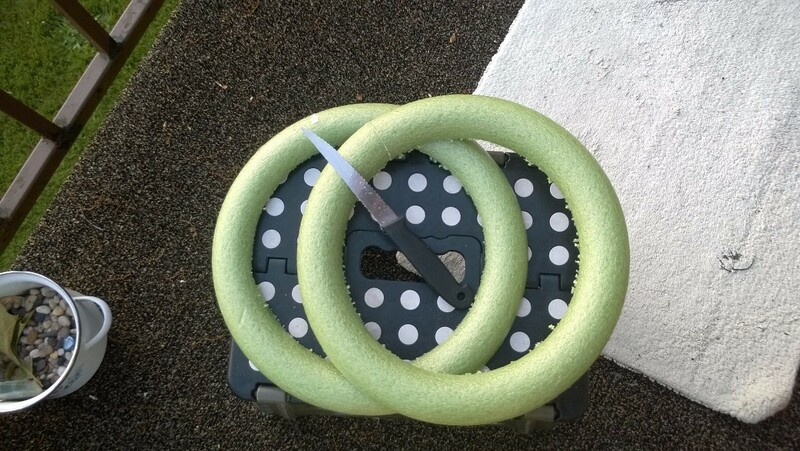 Now you can fire up the hot glue gun. As you lay the leaves down, turn the daisy over and make small dots at each of the 7 petals. Carefully turn them over and place so that a white petal goes between the green leaves. 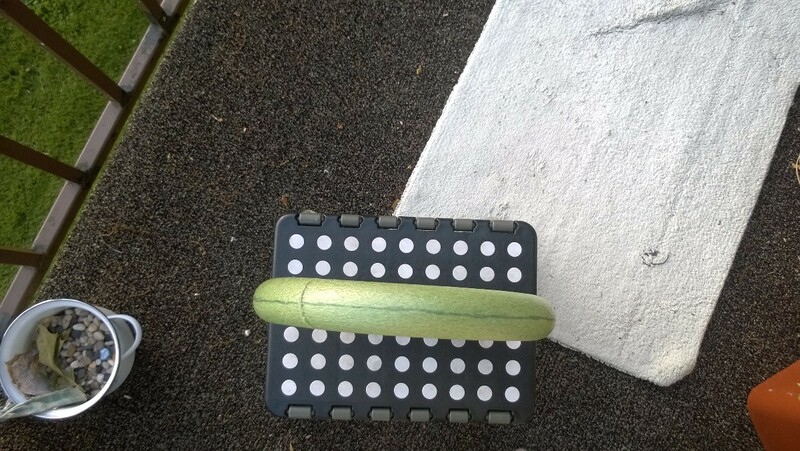 Thus the spacers on the leaf directions. 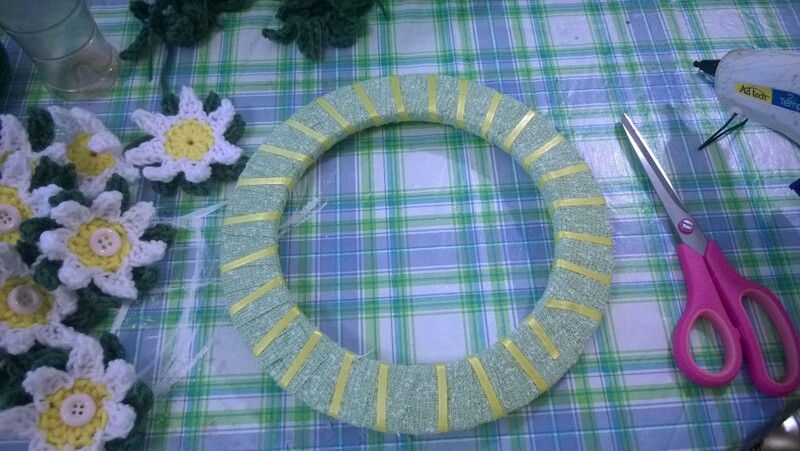 Glue the button onto the center of the yellow and each daisy is done. 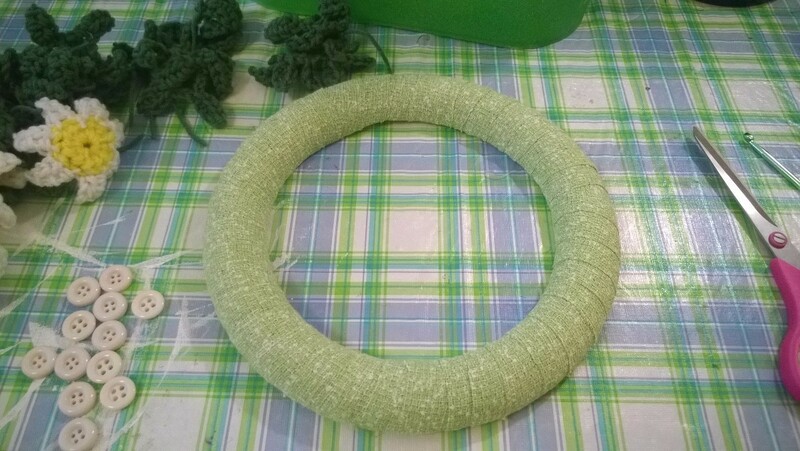 Someone brilliant suggested we cut our Styrofoam wreath forms in half, doubling our productivity and savings. I found it was easy but I don't suggest you do it with a steak knife. With a flat side and a serrated side, it tends to want to cut at an angel. But it worked okay for my first time. I would mark it around like I did and make sure it's steady. 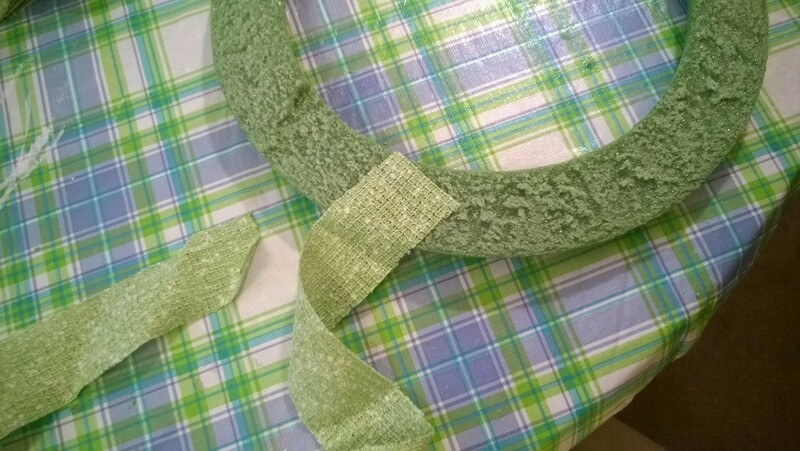 I chose some light green tweed to cut into strips and wrap around. I wanted it lighter than the petals and a bright color. 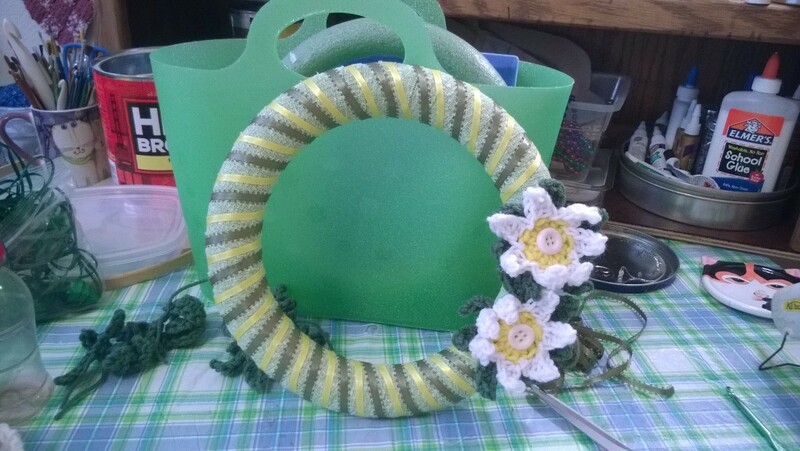 I chose a bright ribbon to match the daisy center. Then I went with a ribbon to match the leaves to blend it all together. You may notice I went the opposite way with the ribbons. That was on purpose. You can do it the way the fabric is if you want. 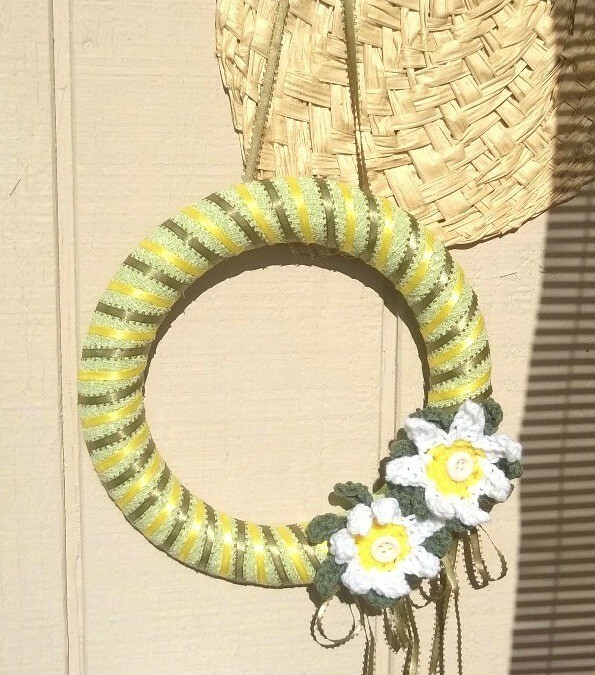 I added some ribbon for a hanger and glued on just two daisies. I then make two ribbon bows with the green and was done. I kept it kind of simple this time. I hope you N-JOY! !